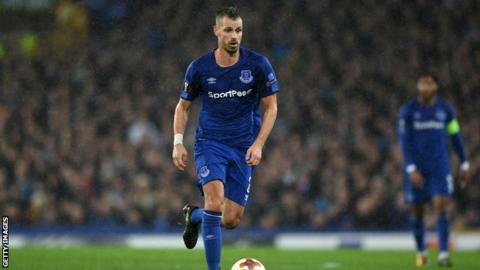 West Ham are keen to sign Everton midfielder Morgan Schneiderlin - but are only interested in a loan move. Everton are willing to part with the 28-year-old before Wednesday's transfer deadline, a year after signing him from Manchester United in a £24m deal. But the Merseysiders would prefer to recoup £20m in cash, and are reluctant to do loan deals that will not carry any certainty of a return. France international Schneiderlin has played 29 times this season. West Ham feel it is unrealistic for them to pay roughly the same price as Everton bought him for given his form since. They feel it would be better to assess Schneiderlin over the remainder of the season before deciding whether to spend such a significant sum on the former Southampton player. Everton manager Sam Allardyce has revealed loan moves for summer signings Davy Klaassen and Sandro Ramirez have been rejected in this window. Allardyce retains an interest in Sevilla midfield Steven Nzonzi, whom he signed when he was at Blackburn Rovers and has recently been unsettled at the La Liga club. If Everton can agree a deal for Schneiderlin, or £25m summer signing Klaassen if interest from elsewhere continues, it would free up finance and a space in the squad for Nzonzi.